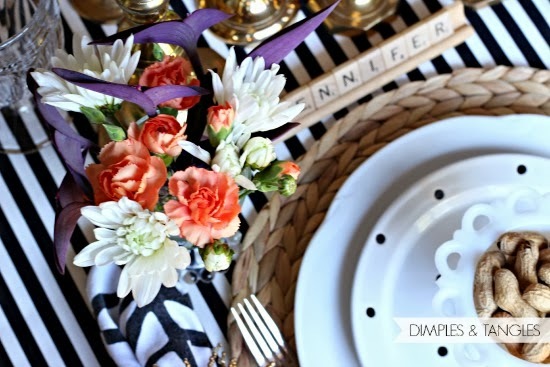 Since the dining room was all cleaned up and looking good, I couldn't resist setting a pretty table! I like to think of this as an "Early Fall" table, with just subtle hints of the season. Keeping true to my norm, I used everything I already had for this table, with a few exceptions. After I spotted them, my parents bought me these polka dot salad plates for my birthday, so those are new. (PS, they're from Target, although I've only seen them at Super T.) I thought they were very Kate Spade-ish, and I know they'll get lots of use around here! Also, I raided my Mom's brass candlestick stash and borrowed those, but had to buy the white taper candles. Why I didn't have some of those, I don't know! The "runner" is a piece of fabric that I folded to the size I wanted and tucked the ends under. Actually, it's 6 yards and someday it's going to be on the loveseat that's going in the kitchen. 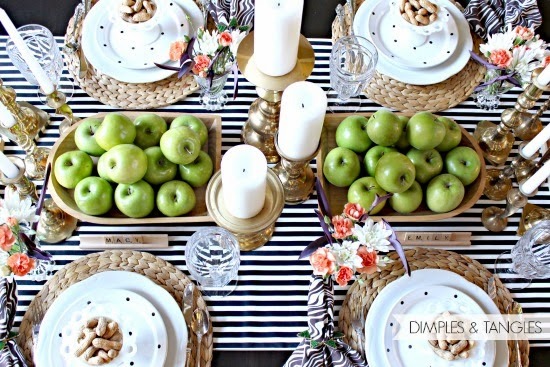 The seagrass mats are from Ikea, and the carved bowls that the apples are in were a thrifting find. I almost passed them up but then realized they would be perfect down the center of a table! I couldn't resist slipping some of the polka dot plates in my china cabinet, but I forgot to take a good photo of them. The lighting isn't great here, but it's the best one I got. Sometimes I like the idea of individual bouquets of flowers at each place setting, rather than a center arrangement. 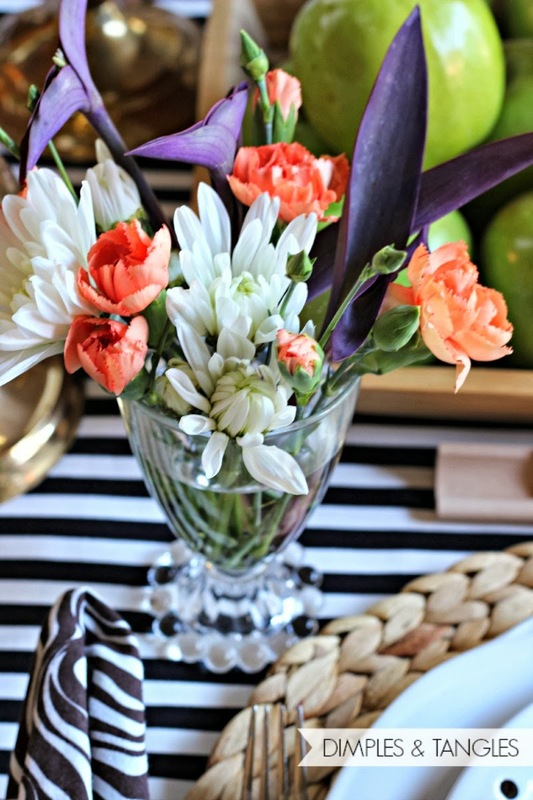 If you've planned ahead, it would be fun to pick up some inexpensive glasses or small vases at thrift stores for each arrangement so you can send your guests home with a pretty party favor. All 6 of these were done with 2 inexpensive grocery store bouquets, and I added in some purple heart clippings from my flowerbeds...it's going crazy! To finish it off, I used Scrabble trays and letters for the place cards. 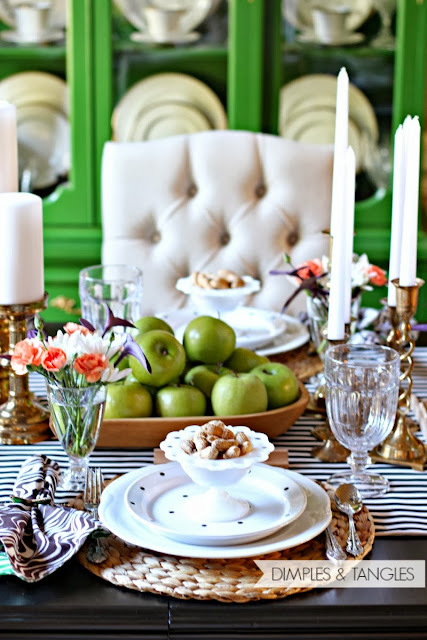 So, the apples, texture, wood, brass, nuts and flowers just hint at Fall to me. 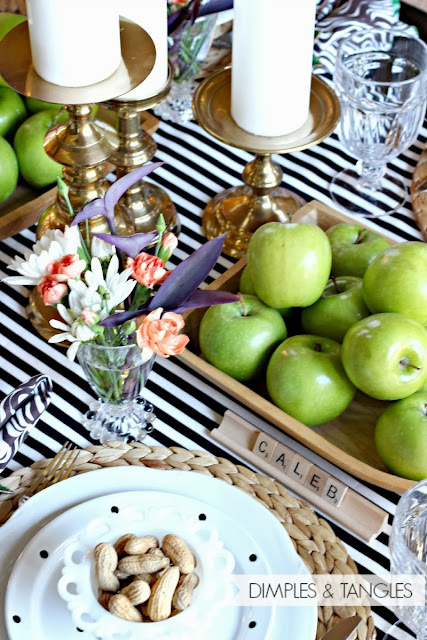 I've already got a plan forming for a Thanksgiving tablescape, so stay tuned! 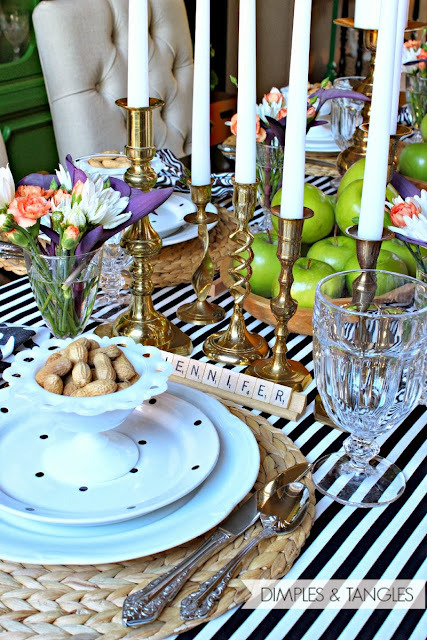 Jennifer your photos are amazing and your table looks beautiful! so pretty! 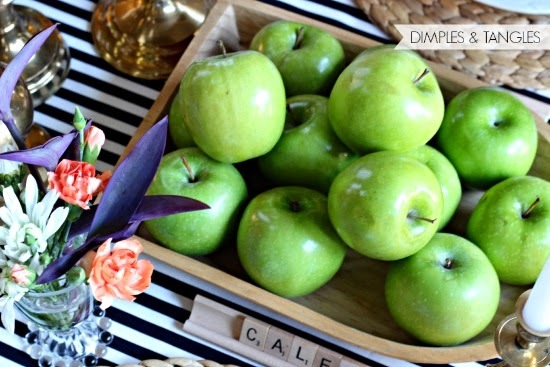 love the green apples! Oh man you went all out. Love it all, every single detail. The photos are amazing. How do you get the lighting to be so great?? I love it all! 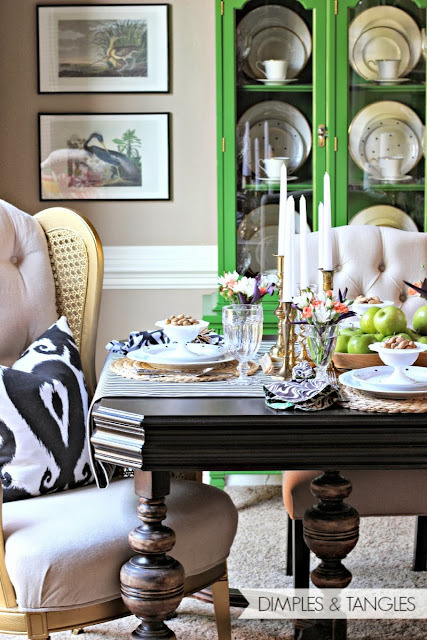 Especially the black and white touches mixed with green! Everything looks so beautiful together. I love your style. Such a lovely tablescape. I am pinning! Thanks! You always have my heart with all of your black and white touches! I am loving the runner and the flowers you used on your table. 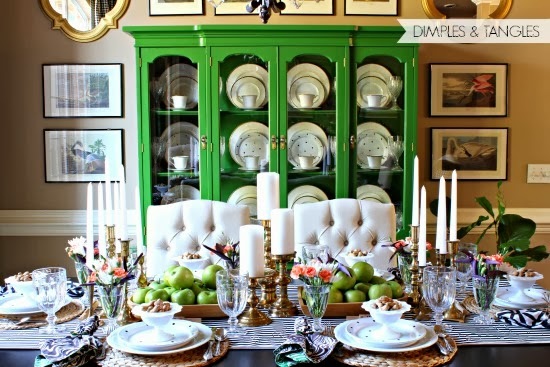 The green apples look fabulous on the table with that green hutch! Love it!!! Such creativity!!! You did such a fantastic job, as always!!! Gorgeous! 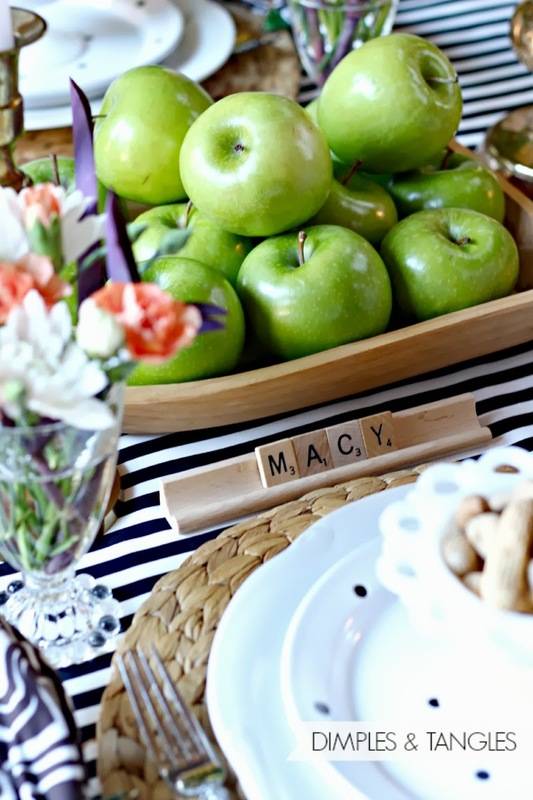 Love those polka dot plates and the scrabble name cards are GREAT! The photography here is stunning Jennifer! I love the table scape. The polka dot plates are fab!!! Great job! Beautiful, Jennifer!! I JUST bought myself some black & white fabric to make a table runner out of (inspired by that tablescape we were swooning over last week! 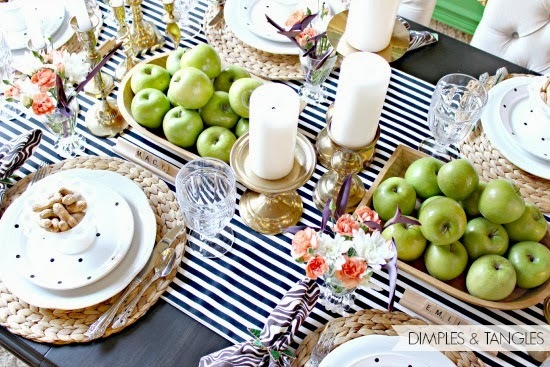 )….and I have those same rattan placemats so I will be referring back to this tablescape in the future, I'm sure! 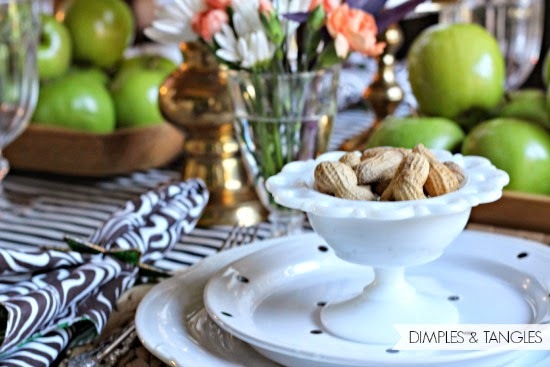 Your black polka dot plates are so cute, now I need to score some of those as well! I am so in love with the combo colors and patterns you have used! Beautiful job!! Ummmm WOW. This is absolutely unbelievable amazing!! It looks straight out of the pages of any shelter mag. 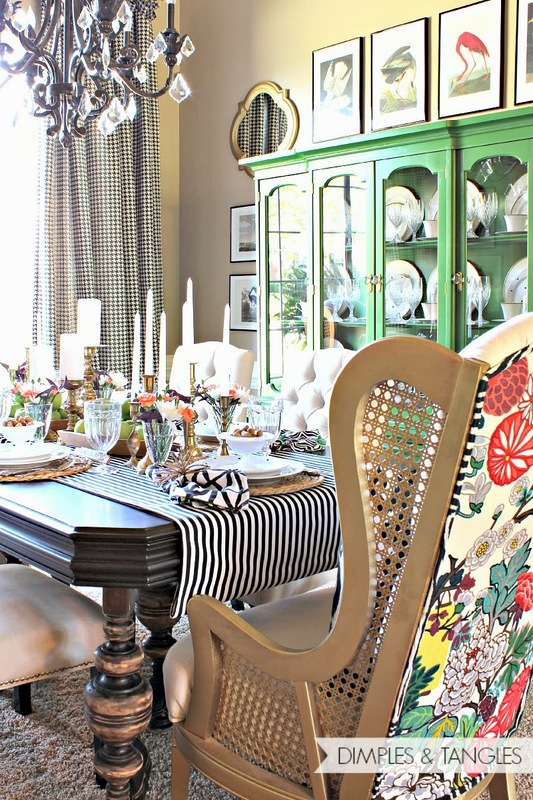 I love the stripes with the polka dots and the green with the peach flowers. So gorgeous!! So beautiful! Who wouldn't want to eat dinner at that table! Love love love this!!! You had me at Polka Dot plates! Well, I think you're on to something here, Jennifer! Beautiful eye, you have! It all starts with the green hutch! That says a lot! Popped over from this that and life. Love your dining room tablescape. Off to peruse the test of your blog.